Pour pretzels into a large bowl. Combine oil, sugar, and cinnamon in a small bowl. Pour combined mixture over pretzels and mix well to fully coat the pretzels. 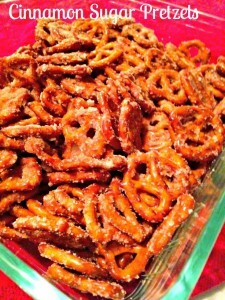 Place coated pretzels on a cookie sheet or roasting pan. I used this Pyrex. Bake for 25-30 minutes, shifting and shaking cookie sheet a couple of times during the baking process.